On Thursday, a paper published in Scientific Reports raised grave concerns about the future of muskoxen in a warming world. Buried in it was one of the most incredible stories I’ve ever seen recorded in a scientific journal—that of a freak winter tsunami that caused 52 muskoxen to become entombed in ice on the shores of Western Alaska. On February 14, 2011, 55 muskoxen clustered in a lagoon at the northern coast of Bering Land Bridge peninsula. A few days later, the closest NOAA-maintained monitoring station registered a tidal episode with a historic high, 16x greater than normal. Accompanied by a fusion of shattered shore ice with plates up to 50 cm thick and 5 m long, the tidal surge trapped at least 52 animals. All but one was wholly submerged. Known as an ivu or ivuniq in Iñupiaq, the language of indigenous northern-coastal Alaskans, these wind-driven polar ice-override surges pile ice to 4 m high, and distribute marine subsidies inland to 20 kms. Enthralled and wanting to learn more, I contacted Joel Berger, a senior scientist with the Wildlife Conservation Society and lead author of the study. He explained how a field survey confirmed that 52 animals had died, several weeks after the herd was spotted during an aerial flyover. Most of the animals were so buried in ice they were hardly visible. The team used a nearby weather station to tie the ice pileup to a winter storm, but the final clincher was Fred Goodhope Jr., an Iñupiat elder from the village of Shishmaref with whom Berger had been working for years. “And so, I asked more about maybe he hasn’t seen a muskox die off but has he seen these kinds of storms, ice being fractured and piled up? And he said oh yea, happens all the time.” That’s when Berger went to an Iñupiaq dictionary, and found that there was even a word for such an event: ivu. It’s hard to do science in the Arctic, a vast, remote, and largely unpopulated region with a harsh environment and little infrastructure. Only recently have scientists started to appreciate that the people who’ve called the Arctic home for millennia are one of our best sources of knowledge about it. Today, growing recognition of the value of indigenous knowledge is spawning diverse collaborations, from sea ice observing networks where Alaskan Native hunters record unusual weather and ice conditions, to a partnership between biologists and whalers in the Alaskan town of Utqiaġvik (formerly Barrow) that’s yielding new insights into the biology of marine mammals. The muskoxen mortality event Berger and his team discovered might have passed peer review without the inclusion of indigenous knowledge. But affirmation that such events have happened before—many, many times—is a powerful thing. In fact, when Berger started to look at historical records, he found that even more spectacular mortality events had been recorded by Native communities. In 1994, hunters discovered 150 narwhals entrapped off the coast of Western Greenland by rapidly-forming sea ice. In 1999, a different group of hunters in the eastern Canadian Arctic discovered about 170 sea ice-entrapped belugas—100 of which were slaughtered by polar bears. Lee cautioned that the weather station data might not have been representative of the conditions faced by the muskoxen, since the station was “still a considerable distance away,” and wind-driven ice push events are highly local. She also said she didn’t think ice push events can be clearly tied to climate change, although Berger noted there’s growing evidence the intensity of coastal storms is increasing in the Arctic. Regardless, Lee says they are a “great example of ways to include traditional ecological knowledge of ice impacts on coastal ecosystems.” UAF, she added, has compiled oral recordings from interviews with indigenous people that include numerous descriptions of ivu, including ice pileups “significantly greater” than the four meter pileups described in the new paper. 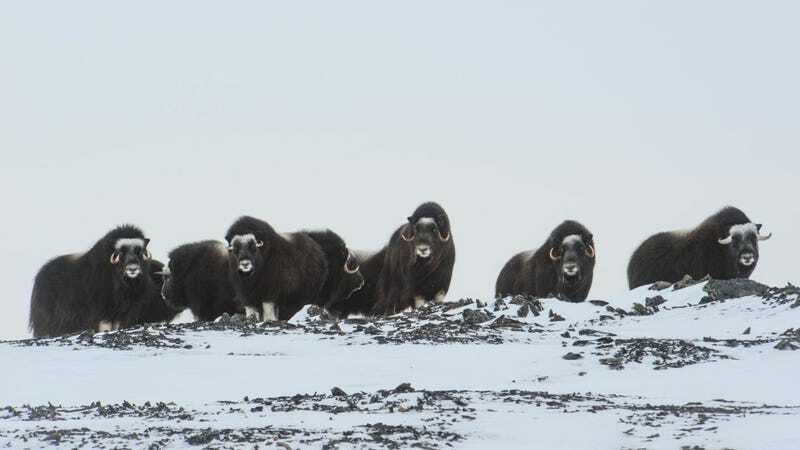 This is but one aspect of the new study, which makes use of seven years of field data across three Alaskan and Russian sites to investigate how weather and climate conditions affect muskoxen, the Arctic’s largest land-based herbivore and an incredibly under-appreciated animal. The study finds troubling evidence that juvenile head growth is stunted when babies are born to mothers that have experienced rain-on-snow events. Rain falling on snow can form an impenetrable icy layer, making it difficult for gestating mothers to access vegetation beneath the ice. In a warming world, winter rainfall events are expected to become more common in the Arctic. This could become a serious problem for future generations of muskoxen, since bigger babies are more likely to survive. While muskoxen have historically declined due to overhunting, the IUCN now classifies the animals as a “least concern” species with a stable population. Still, muskoxen are so poorly studied it’s hard to know how they’ll respond to the rapid warming of their Arctic habitat.